105 mm L/40 SK C/0410 х 1 pcs. 180 Degree Turn Time18 sec. Initial HE Shell Velocity710 m./s. Initial AP Shell Velocity710 m./s. 7.92 mm MG 084 х 1 pcs. 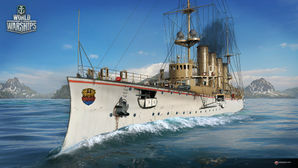 Emden — German promo premium Tier II cruiser. This ship served as a multipurpose protected cruiser of the German Navy. Compared with the lead ship, she had a different type of propulsion. She carried numerous rapid-fire artillery of a relatively small caliber, and was well protected for a ship of her type. The ship was given to players for free during the 2015 holiday season by completing a three part mission series. Sister ship to Tier II tech tree cruiser Dresden, Emden has a storied history worthy of more than a few films and books. Her incarnation in World of Warship is faithful to the legendary raider, and a fun premium for her tier. With a main battery comprised exclusively of 105mm guns, Emden will frequently spew out dozens and dozens of shells for minimal damage. However, she not only has two fewer guns than Dresden, but they also have about a kilometer less range. Her guns are effective against enemy destroyers, but that effectiveness falls off quickly against cruisers and battleships. Her armor piercing shells lack adequate velocity and power to penetrate anything but other lightly-armored cruisers, and even then only at point-blank ranges (5.0 km or less). Max AP damage is 500 less than her sister ship's shells while the arc on both their shells is fairly high; landing hits at maximum range will require a significant amount of lead, and AP damage at such ranges will be low or non-existent. Smart captains can use her shell arc to her advantage, however, by using islands as cover and firing over them. Her main battery is weaker than that of Dresden as well; she has fewer guns overall and weaker armor-piercing shells. Most players won't spend a ton of time in Emden — enough to make some quick credits or re-train a commander — which makes her faults and weaknesses easy to overlook. Overall, she is a fragile ship with relatively weak guns that excels at eliminating enemy destroyers but struggles against most anything else. Excellent at killing enemy destroyers. Her 105 mm main battery guns can be upgraded with Basic and advanced firing training. Is essentially a clone of Dresden in every way that matters; players familiar with her sister ship will have no problem playing her. Shortest firing range of all Tier II cruisers. HE shells do extremely small amounts of damage and AP is practically worthless. Fairly low health pool for her tier. Her secondary battery is only cosmetic and doesn't actualy fire at enemy ships. As a premium ship, Emden doesn't have any upgrades to research. Key skills for Emden commanders include Preventative Maintenance, Adrenaline Rush, Basic Firing Training, and Concealment Expert. Additional skill points should be invested in Last Stand, Priority Target, Expert Marksman, High Alert, and Demolition Expert. As a premium ship, Emden comes included with Type 9 camouflage that lowers her detection radius, reduces the accuracy of incoming shells, and increases the amount of experience she earns. 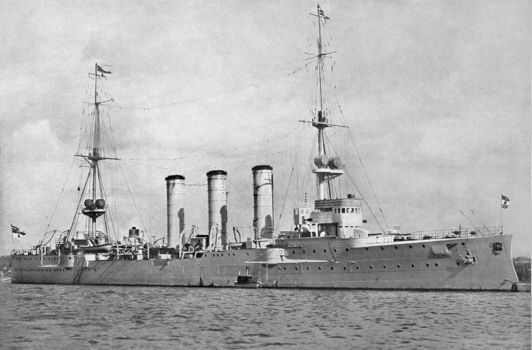 SMS Emden at anchor, circa 1914. SMS Emden was the second and final member of the Dresden class of light cruisers built for the Imperial German Navy (Kaiserliche Marine). Named for the town of Emden, she was laid down at the Kaiserliche Werft (Imperial Dockyard) in Danzig in 1906. Her hull was launched in May 1908, and completed in July 1909. She had one sister ship, Dresden. Like the preceding Königsberg-class cruisers, Emden was armed with ten (10) 10.5 cm (4.1-inch) guns and two torpedo tubes. Müller then took Emden to raid the Cocos Islands, where he landed a contingent of sailors to destroy British facilities. There, Emden was attacked by the Australian cruiser HMAS Sydney. The more powerful Australian ship quickly inflicted serious damage and forced Müller to run his ship aground to prevent her from sinking. Out of a crew of 376, 133 were killed in the battle. Most of the survivors were taken prisoner; the landing party, led by Hellmuth von Mücke, commandeered an old schooner and eventually returned to Germany. Emden'​s wreck was quickly destroyed by wave action, and was broken up for scrap in the 1950s. Emden was sunk during World War I and only served with the Imperial German Navy, yet it flies the Kriegsmarine ensign of Nazi Germany. The flag itself did not exist until the 1930s. Emden in Tsingtao in early 1914. Emden beached on North Keeling Island. One of Emden’s 105mm guns is on display in Hyde Park, Sydney, Australia. This page was last modified on 4 December 2018, at 21:54. This page has been accessed 26,074 times.